Just a few hours after Amazon pulled the first Kindle Fire tablet from sale, The Verge has been sent an image of what it says is the next version of the tablet, due out next week. Reporting on the image, Chris Ziegler says that the site has been informed that “a pair” of new Kindle Fire devices in 7″ and 10″ configurations is on the way. 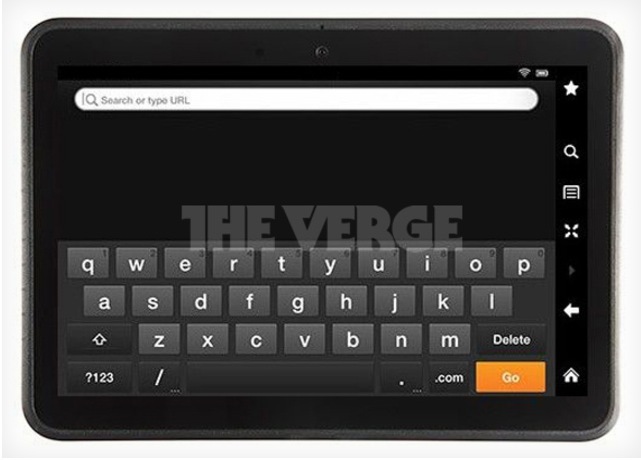 The tablet appears to have a 4:3 screen ratio and features what appear to be a modified version of the Kindle interface including keyboard. The change in aspect ratio is notable as the original Fire had a 17:10 ratio, which is longer and narrower. The common wisdom is that narrower ratios are better for displaying media content like books and movies. Apple’s rumored iPad mini is said to maintain the current iPad’s 4:3 ratio as well. There is also a camera at the “top” of the device and what is likely a microphone hole. The position of the camera on the long edge means that the orientation of the device has changed to a default of horizontal, rather than vertical. The buttons along the right side of the device appear to be software, not hardware. This means that they could be altered or shifted in orientation as the device is rotated. Obviously, Amazon’s Kindle Fire “2” product would be primarily a way for it to continue to funnel its content to users, which is what the point was with the original. Only, this time around, it will likely have a robust competitor in the iPad mini. We’ve already discussed just how a smaller Apple tablet could succeed based on being a conduit for content. Largely due to the fact that Amazon’s content is largely available in the U.S. only, while Apple has enormous worldwide licensing deals already in place for music, books, movies and TV shows. Earlier today Amazon reported the Kindle Fire as being “sold out“, but what it really meant was that it had pulled it from sale. It also made claims about the Fire holding a 22% share of the US tablet market, but continued to produce no numbers to back that up. Amazon’s event is set for September 6th in an effort to announce its holiday products before Apple does. Later in the day, The Verge also came up with an image of a new Kindle ‘paperwhite’ product, which appears to be a Kinde Touch with a higher contrast display and an integrated sidelight of some sort. You can head over to The Verge for more information about their leaked image.